I field a lot of curious comments from people about how I have time to make quilts when I have 4 children. Usually I say that I'm an early riser and then I can steer the conversation toward more interesting topics. This works almost all of the time. The one time it didn't, the woman sniffed, "Well. Your kids must watch A LOT of TV." You know the lip-lick-narrowed-eyes-slow-blink that happens when you're thinking of a lot of bad words? Yep, I did that and then replied. "They don't and I don't either. That frees up a lot of time." That used to be true. Now I have a baby girl that loves to be held. She doesn't waste time with the lip-lick-narrowed-eyes-slow-blink and proceeds directly to dramatic blotchy-face-bellow-weeping if I am too far away from her. So, I've adjusted. I do watch way more TV than I ever used to, and I sew with a baby sidekick. My sewing space also doubles as a guest bedroom and we have a full size bed in there. My kids love to come in and lounge while I am making things. We did a lot of that this summer. I really do get up early and work. If there are things I'm considering and experimenting with, those quiet minutes of alone time are when I do it. As soon as the kids wake up, I hear them running down the stairs straight to the sewing room. That's when I multi-task. I iron a pile of blocks and visit with them. I cut some more strips to replenish the piecing bucket and tell them a story. I move blocks around on the design wall (or have them do it) and listen to them tell me about the weird dream they had. ...then they start fighting over who gets the pillows, the boys start wrestling and my little girl gets shrill because her brothers are ignoring her. That's when I shoo them upstairs for breakfast. It isn't all domestic tranquility. 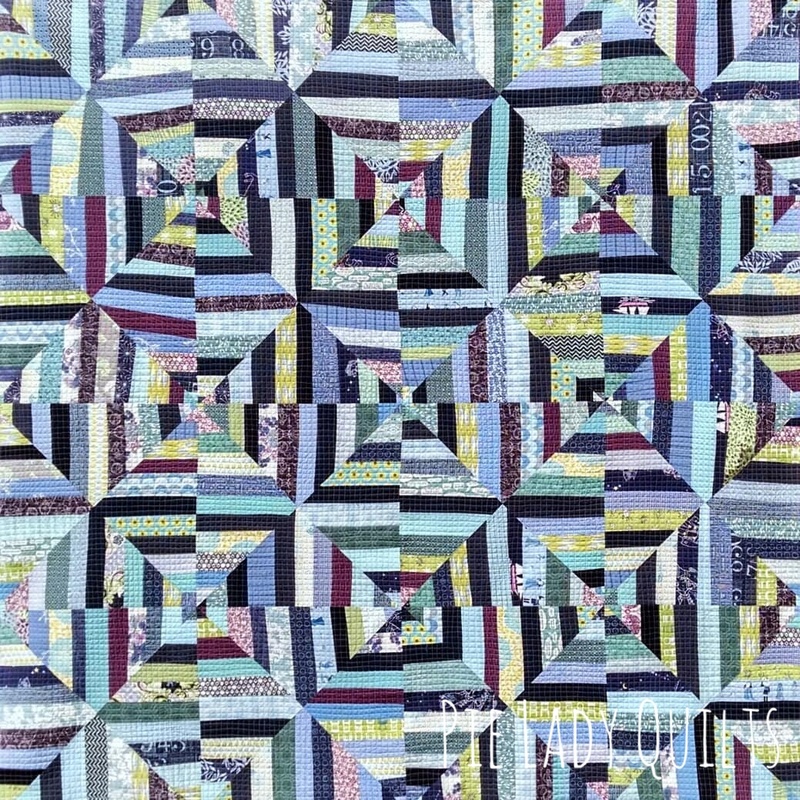 This summer I saw Julie Silber post a vintage quilt on her Instagram page. (If you don't follow her, please do, you'll gain an increased love and knowledge of the history of quilting...@juliesilberquilts) After I studied the quilt, I decided to make a version for the bed in my sewing room. I was thinking of my children when I started pulling out scraps, so there are a lot of fun juvenile prints in the mix. I constructed the quilt using newspaper as the foundation. I used the 45 degree line on my 15" ruler to make triangle templates. I use newspaper foundations quite a bit, so I have a dedicated rotary cutter that's just for paper (I mark it with tape so I don't forget). It made gigantic triangles. The newspaper was *just* long enough. A finished block was 4 of those triangles sewn together. I had to square those down to 21" using the 45 degree lines on my cutting mat. They were massive! I finished the quilt with freehand crosshatch quilting. My prize for winning the viewer's choice in the Pantone Quilt Challenge was a cone of Aurifil thread. When I received it, I had to smile. Someone at Aurifil definitely has a sense of humor. Since the color of the year was purple, I was sent a cone of purple thread. Light Lilac to be exact. My streak of practicality is about a mile wide, so Light Lilac was the color inspiration for the quilts in this post. I pieced and quilted this with it. I brought all of my kids with me for the photography session at a local farm. #2 and #3 played with #4 in the shade while #1 helped me hang it on the barn. It was miserably hot that day, so we went home sweaty and tired. As a mark of profound appreciation for their help, I made them all banana splits and told them that they could name the quilt. #2 blurted out "Blue Lightning" and we all agreed. "Blue Lightning" finished at 82" x 82." It's on the bed in the sewing room where it has been quality tested by #1-4. They like it. My mother also is a quilter and has been known to shop for me. 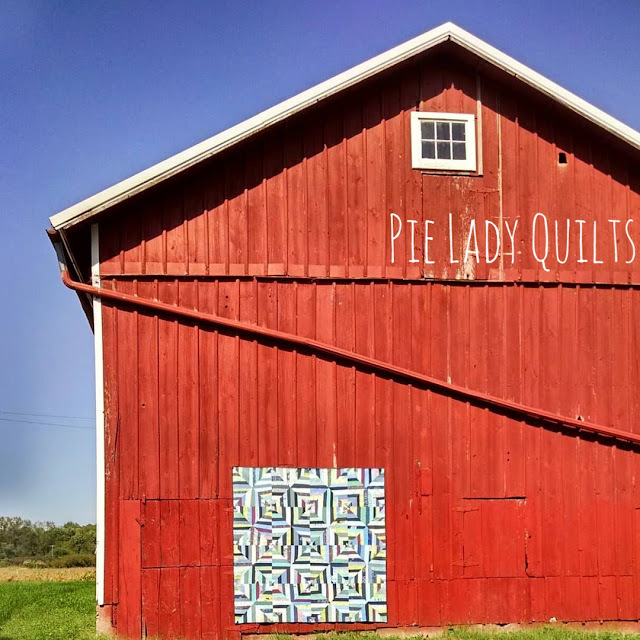 She was in a quilt store once and saw a bolt of Tula Pink fabric in the clearance section. She bought the bolt and sent it to me. As the years have passed, I've looked at that Parisville fabric and wondered what my game plan should be. Hoard? Sell? Use? I decided to use it. That is what fabric is for, right? 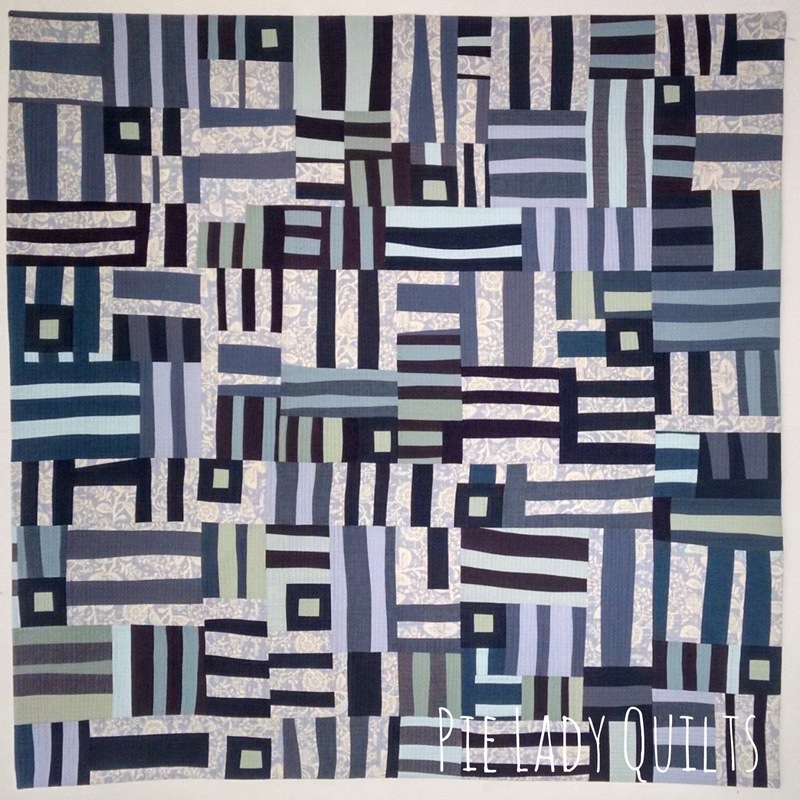 It became the backing for "Blue Lightning" and also the spark for the next scrap quilt, "Riffing on a Rail." 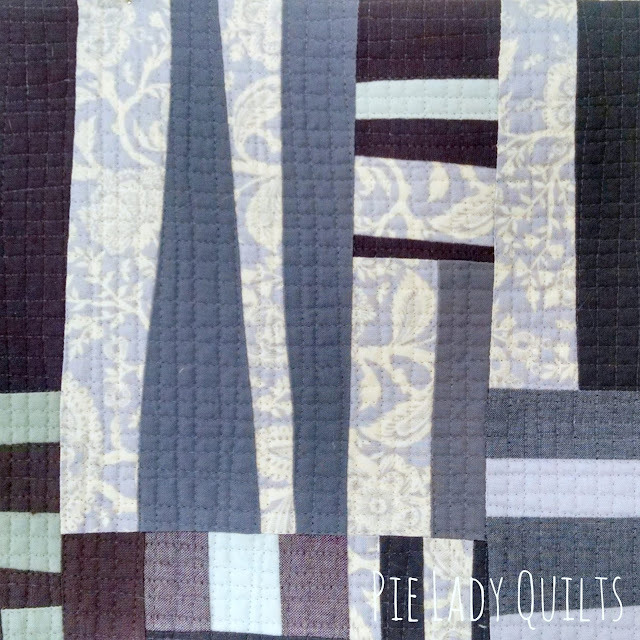 I was inspired by the leftover strips I trimmed off the backing and I thought using a rail fence motif would be an effective use of what I had left. I added dark blues, light blues, slate blues, lilacs, sage greens and dull reddish plums and kept making units. I calculated how much of the Parisville I would need for the backing and facing strips, then built the top out as far as I could take it with what I had left. I was able to get to 48" x 48." 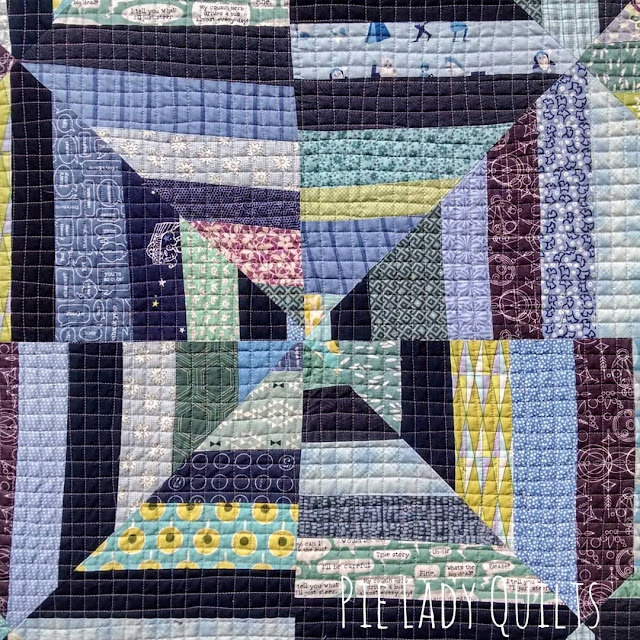 I pieced the whole thing with Light Lilac, but I did the quilting with monofilament so I wouldn't alter any of the color work. 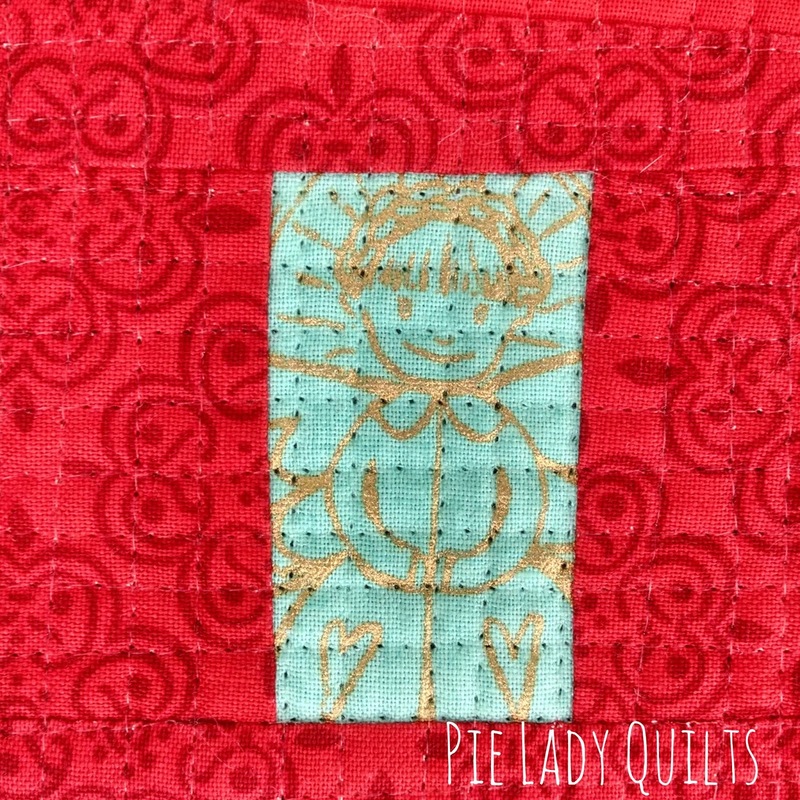 I quilted this in a very dense freehand crosshatch pattern. It is finished with a faced edge. Of course I had scrap strips left over, so I started string piecing half square triangles with some of the lighter values. I made about 4 of them before I realized that I hated the colors and the vibe (hello, Easter). I still liked the idea so I tried again with darker values and felt much happier with the results. If you're wondering about construction, I used newspaper foundations again. I made them a little bigger than I needed them so I could just eyeball where that center seam would have to go. A little extra wiggle room made squaring them easy. Once I had the top done, I joked to my husband that now I needed to decide if I should make it into a mini that we didn't need or a pillow that we didn't need. While I was thinking about it, I pressed forward and started quilting it and I had a moment of profound connection. Remember how I said that I was watching way more TV than I ever used to? Well, I try to watch things that keep my brain from rotting away to mommy mush and found a show on Netflix called "Civilizations." It's a program, narrated by Liev Schreiber, that shows art from ancient cultures. In the first episode, cave art hands are discussed. Images of hands thousands of years old are preserved in caves all over the world. Ghostly silhouettes from across time send messages of connection and presence. The handprints, backed with red ochre, are breathtaking pieces of art because they are brimming with meaning. I absolutely loved seeing them. 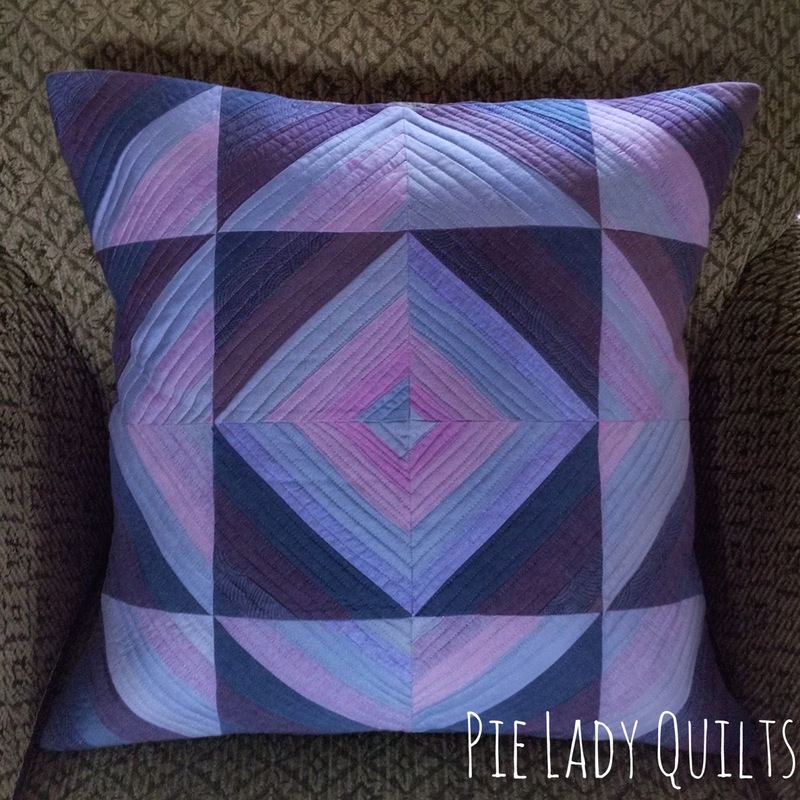 As I was quilting this pillow in an outward spiral, I had my hands all over it and they stood out just as starkly against the deep plums I used. I stopped thinking of it as another object that I didn't need and rather as an expressive message of self. I need to do a better job of explaining to my children why I choose to spend so much time in the process of making and that the value of the finish is so much more than another object of utility. 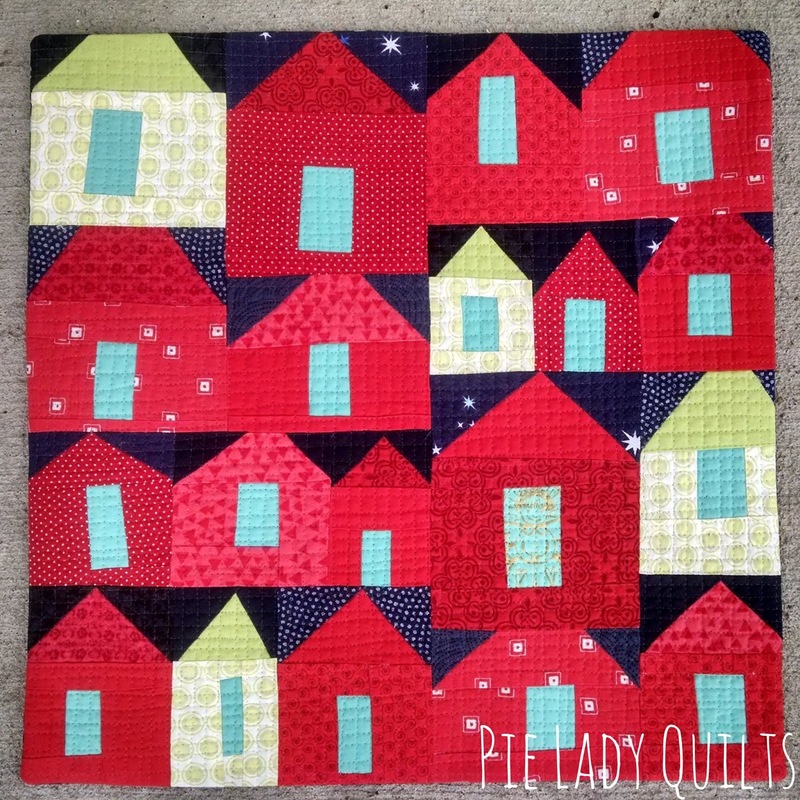 Someday when I am gone, my quilts will not be. I hope that my family feels and sees my hands through the images/objects that I leave behind. This pillow is 20" x 20." I participate in the Curated Quilts mini challenge every time I'm able. I enjoy trying new things in a small scale or revisiting things I liked in a different format or color way. The last prompt was "house." I felt compelled to make something that immediately came to my mind. As many of you are aware, I live in Iowa. This summer a girl named Mollie Tibbetts went for an evening run in a small town about 45 minutes away from us. She never came back from that run. Her family and the community banded together and distributed thousands of missing person fliers. I saw her face at the grocery store, the library, the gas station and at the state fair. Through the repeated exposure to her face, our connection to her grew. She felt like family. My children knew her name. We learned with great sadness that the massive hunt ended with the discovery of her body in a cornfield. In the mini, "For Mollie," I wanted to honor her and express the sense of loss I felt. I left the light on in every house and brought her back from that run in the only way I was able to. Thank you so much for visiting the blog and reading this post. I appreciate the connection that the blogging medium gives us and for the mutual loves we share. Have a great day!